Students crowded a small lab room, leaning on the black counters as they tried to balance on rickety stools. Beakers and Bunsen burners were strewn across each workstation. Lab notebooks with scribbled numbers and shaky graphs drawn on crinkled pages lay beside each student. And in the midst of all the chaos a man sat curly head dipped down as he grades papers from one of the many haphazard piles that sat before him. His goggles are perched over his reading glasses and he is recognizable by his signature tie dye lab coat. 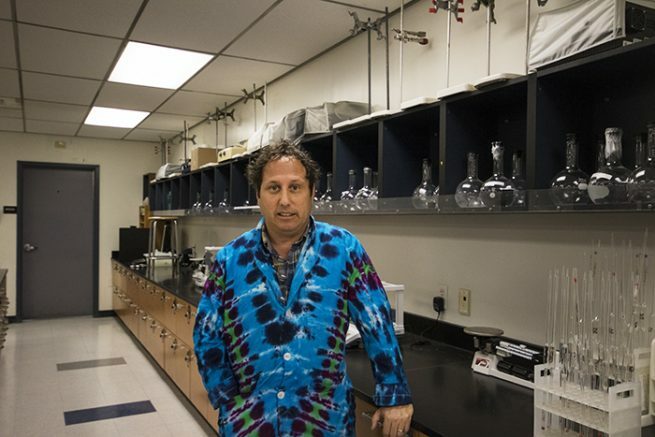 Brian Weissbart has been a chemistry professor at American River College since the early 2000s after leaving a non-tenured instructor position at Washington State University. “I was trying to stay ahead of the killer bees,” Weissbart said with a laugh. Originally from Orange County, Weissbart moved up the state for schooling at UC Davis. From there he graduated and moved even farther up north to Washington state, where he spent the next 10 years. As a freshman at UC Davis, Weissbart says he had no real clue what he wanted to do with his life. He knew he liked math and science and thought he’d follow his father—a physician—into the medical field. “He was not particularly encouraging of that,” Weissbart said. Not out of any malice, but because his father Seymour Weissbart believed that doctors no longer had the same freedoms that they used to, and that the business aspect of the medical field was growing more dominant. He wished for his son to follow his dreams and to do what he loved. But his father had little to worry about because as soon as Brian Weissbart stepped foot into his first general chemistry class一a requirement of all science majors一he knew he had found his calling. Weissbart said one of his greatest hopes is to share his passion with as many people as possible. Weissbart has followed his college professors’ example and says he tries to incorporate as many demonstrations as he can. He says his favorite class to teach is Chemistry 400, a general chemistry course very similar to his favorite course at UC Davis. He enjoys showing his students the practical real world examples of what they are learning. He tries to get to know his students and to take an interest in their interests. “I feel like people are more motivated to learn if the instructor cares about them,” Weissbart said. His students are proof of the sentiment. Carmen Vinella, an astrochemistry student of ARC, took Weissbart’s General Chemistry class in the fall of 2016. Her favorite part of the class was Weissbart’s teaching methods. He had an approachable demeanor and a willingness to go over something repeatedly until they understood the subject. Vinella says he made her love the subject even more. Wanting to see others succeed seems to be a family trait. Weissbart’s parents wanted everyone to have the opportunity to accomplish their goal. After his father died his mother expressed her wish to have a scholarship in memory of Seymour Weissbart, and after a long discussion they came up with a solution. Each year at American River College, all Beacon Tutors have an opportunity to apply for a scholarship especially designed for them. Every year $500 is awarded to one student to do with as they will. “My dad was a big proponent of, ‘if you’re struggling with something, go get help’ and so Beacon Tutoring goes along with that philosophy I think,” Weissbart said. Adriana Eslamian, an anthropology major, has been a Beacon tutor for two and a half years. She says she became a tutor to help retain the information she learned, and wanted to help people at the same time. ”I just really enjoyed having him as a professor and so when he asked me to be a Beacon tutor for him, I said yes.” Eslamian said. When Weissbart was working for Washington State, the institution hosted a program that ran seminars on high school chemistry teachers around the country, teaching them different skills and ways to incorporate said skills into the teaching of their students. At the time Weissbart was training the teachers on how to use Microsoft Excel in a lab setting. Because the teachers were not charged for the lessons it was not unheard of for the high school teachers to give gifts in repayment, and so one teacher, a woman from a private catholic school in New York presented him with his first tie-dye lab coat. It sat in that closet for about two years until he took a chance, tried it on, and got a great response. However, due to daily wear and tear, Weissbart purchases a new coat every year and takes it to Hippy Bob, an Auburn resident, to have it dyed. All of his previous coats can be found hanging off a hook on the back of his office door. 1 Comment on "Chemistry professor re-ignites student’s passion for science"
I took Honors Chemistry from Professor Weissbart at Wazzu in 1997. He was one of the best instructors I had while I was there. His passion for teaching was unmatched by the rest of the chemistry faculty (who mostly preferred their research to dealing with freshmen). I greatly appreciate his ability to explain to us the concepts and help prepare us for the rest of our time at WSU.